Martin Holmes' World Rallying annuals, for the 19th time with the support of Pirelli, are recognised as the leading books on international rallying in the world. 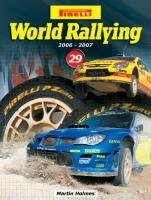 Previous editions have established this annual as the leading reference book of the sport, used by the industry, journalists and rally fans all over the world. Although centred on the 2006 World Rally Championships, there is also coverage of the Asia-Pacific, Middle East and African regional championships, and many national championships around the world, all of which are illustrated comprehensively, primarily by Maurice Selden's photography. The book also gives a unique appendix of results of all the major national rally championships round the world. Pirelli World Rallying 29 will carry various features relating to the people and subjects which become topical as the season progresses. Other contents include the regular features concerning car developments and specifications, top drivers' records, the World Championships roll of honour and a diary of the most significant features of the year.